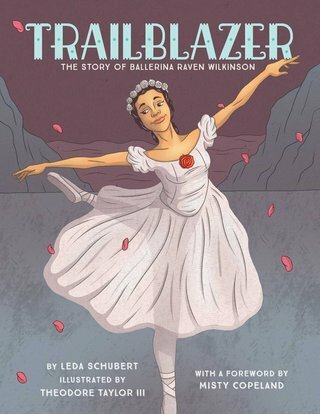 Leda Schubert * Writer of Picture Books - TRAILBLAZER: THE STORY OF BALLERINA RAVEN WILKINSON, with an introduction by Misty Copeland and a letter to young readers from Raven Wilkinson. TRAILBLAZER: THE STORY OF BALLERINA RAVEN WILKINSON, with an introduction by Misty Copeland and a letter to young readers from Raven Wilkinson. We've got a cover!! Yay!! Schubert presents a moving profile of Raven Wilkinson, the first African-American woman to dance with a major American touring ballet company. After years of studying ballet, Wilkinson was accepted into the Ballet Russe de Monte Carlo in 1955. Schubert describes Wilkinson’s thrill in performing around the United States, even as racist attitudes limited her opportunities and posed real threats to her safety; in one scene, four of Wilkinson’s fellow dancers stand protectively around her after men rush the stage at an Alabama performance, angry about the “nigra” in the dance company. Taylor illustrates in a style evocative of midcentury comics, juxtaposing graceful dance scenes against a backdrop of racial turmoil. This admiring portrait is bookended by a foreword from dancer Misty Copeland and a grateful closing note from Wilkinson. Ages 6–9. "Throughout, Leda Schubert’s flowing text and Theodore Taylor’s appealing animation-style artwork emphasize Wilkinson’s hard work, talent, quiet dignity, and perseverance, and reveal the importance of remaining true to one’s dreams." Grades 1-3. African American Raven Wilkinson broke the color barrier for touring American classical dance companies by joining the Ballet Russe de Monte Carlo in 1955, and she traveled the U.S. dancing beautiful ballet while confronting ugly bigotry. Raven’s love for and commitment to her art saw her through such difficult times as when her troupe’s stage was rushed by men spewing epithets. Schubert’s succinct text places Raven’s life in the context of Brown v. Board of Education and the KKK. Many of Raven’s own words and descriptions are used, such as her recounting how she sometimes lightened her skin while refusing to “deny my very being and who I was.” These are accompanied by Taylor’s clean, large-scale pictures. Back matter includes a personal note from Raven, a glossary of ballet terms, and a bibliography, and her important story and inspiring impact is brought forward with a connection to, and personal testimonial from, the contemporary dancer Misty Copeland, whom Raven inspired—just as she will inspire readers. Gr 2-5-Schubert lovingly tells the life story of Raven Wilkinson, the first African American ballerina to tour with the Ballet Russe de Monte Carlo. From the age of nine, she was enamored and determined to make it as a dancer after an uncle gave her the gift of ballet lessons. Schubert chronicles the many injustices Wilkinson experienced over the course of her career because of racism, including segregation, violence from the Ku Klux Klan, and being denied prominent roles. After performing for several years in the United States, she moved to Holland where "people were far more interested in who I was rather than what I was," but she later returned to the States and performed with the New York City Opera until the end of her career at age 50. Taylor's animation-style use of heavy outlines and muted tones captures the poise and athleticism of Wilkinson. A foreword by Misty Copeland, who credits Wilkinson for being a friend and a mentor, addresses Wilkinson's legacy and importance for future ballerinas, especially in regards to the lack of diversity in classical ballet. VERDICT The importance of hard work and pursuing one's dreams is the loud-and-clear message of this engaging biography. A great addition to nonfiction picture book collections, especially where there are fans of ballet. A picture book biography of the first African-American ballerina in a major touring troupe. To be illustrated by Theodore Taylor III; coming in 2018 from little bee press.